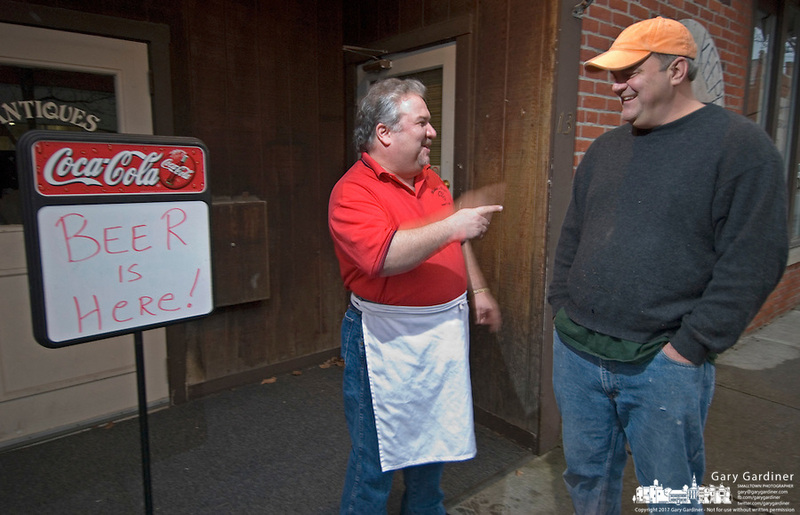 Michael Evans, left, laughs with Mike Purdum as they stand near the doorway of Evans' pizza restaurant Friday, January 13, 2006, on the first day of alcohol sales in downtown Westerville, Ohio. A ballot issue in the November 2005 election approved alcohol sales in downtown Westerville, home to the Anti-Saloon League. Michael's Pizza is one of several new alcohol sales permits in the city. Purdum is opening a bar and restaurant in a refurbished building at the center of town, just a block from Evan's shop. Alcohol was last served in the city more than 120 years ago.